To develop and supply unique evaporation and other retrofits to upgrade standard web metallizer for added value products without hampering the existing capabilities for aluminium metallization. Contract vacuum development projects and R&D coating services for unique products and applications. Vacuum web metallizing training workshops for troubleshooting solutions. Analytical services for coatings and films using x-ray, scanning electron and atomic force microscopy. Other analytical services are also available. Idvac Ltd. regularly attends national and international conferences and exhibitions in holography, packaging and technical subjects. Conferences are good platforms to tell others about our activities and at the same time hear others talking about their activities. Conferences provide good platform to converse with other researchers and meeting new people and customers to exchange ideas and learn about new products. Idvac managing director, Professor Nadir Ahmed is a regular speaker at Holopack/Holoprint and AWA annual conferences as well as other conferences worldwide. Window films are being used in an increasingly wide range of environments for functional and decorative applications. Solar window films are mainly used for heat rejection, glare reduction, fading, privacy, glass manifestation, safety and security. However, advances in films and metallizing technology mean that new applications can be developed for different uses. Idvac Ltd. develops unique multilayered metallizing processes for window film products, providing cost efficient, effective solutions for issues such as solar control, safety, privacy and glass decoration. This includes heat reflection , bronze, silvery and other coatings for functional and decorative applications. The process know- how can be retrofit onto a standard web metallizer. Scanning electron microscope coupled with x-ray analysis (EDX) is used to examine microscopic details of surfaces and sectioned samples, to identify and analyse features of interest for a wide range of materials such as polymers, emulsion and coatings. Surface morphology and composition of materials can be evaluated and measured. Thermal analysis characterizes sample materials such as polymers over a very wide temperature range to measure glass transition point. The equipment has the highest level of performance so you can have complete confidence in your results. This technique utilizes multinuclear probe to characterize liquid samples for chemical analysis and purity. It is also used to detect counterfeited drugs or active pharmaceutical ingredients. Whether your need basic or comprehensive analysis, Idvac Ltd. would be pleased to collaborate with your company for problem solving and routine analytical requirements. Idvac Ltd. respects the confidentiality of its customers. HRI (Zinc Sulphide) as a semi-transparent coating on embossed hologram for passports, identity cards and driving licence. 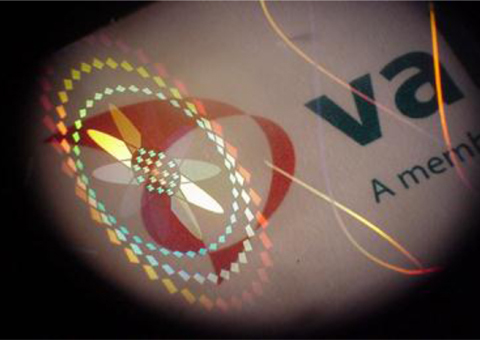 Metallic Copper to add new overt feature to embossed hologram to fight counterfeiting. Chrome Alloy on embossed hologram to provide environmental durability for outdoor applications on car number plates and licence disc. Yellow Gold Colour to add extra visual appeal to embossed hologram. This is a dry process and no chemical inks or dyes are used. Idvac Ltd. has also developed other types of overt and covert coatings for security and decorative holograms. On-Site Intensive 2-day Training Course at customer premises. Metallizer machine inspection and technical advice. Interactive discussion with machine operators and quality control staff. Introduction of added value products for new markets. Valuable information to staff and machine operators. You will learn how to solve vacuum, winding, evaporation and plasma treatment problems usually found in vacuum roll metallizers. You will also learn how to solve problems related to vacuum metalizing on films, paper and holographic products. We will offer technical advice during the course and troubleshooting manual for day to day production.